In April this year, I wrote two blog posts (part I of the post here and part II here) that discussed what could be the MRP (Maximum Retail Price) per page for a bestselling book in India. I found the exercise fun (though at times tedious), and educating. And I hope that the readers and followers of this blog could learn a thing or two about the book market in India. This time around, I thought of repeating the exercise albeit with a few changes. The methodology of data collection and the sources of the data remained the same as before, and I collected the raw data on July 20th, 2104. Therefore, all information, indicators and the ratios calculated for the purpose of this post may change with time. As before, I am also including the data sheet (yay, excel!) towards the end of this post, and those who like playing with numbers may find it useful. Figures 1 and 2 show the summary results from data collection. I think the table for most part is self explanatory, so I will focus on the comparison between the two months. And for reasons mentioned later in this post, I have compared the data across four online retailers only (Amazon.co.in, flipkart.com, google Play (India) and Infibeam.com). The MRP per page fell between March and July across all sites except Infibeam, where the price actually rose. Since we are comparing MRP and not the discounted price, it does not mean that Infibeam is selling books at a lower discount compared to its competitors. It is likely that their bestseller list has a different set of books that are priced higher than the competition. The reason why MRP per page fell for fiction books could be because the sets of books that featured in bestseller lists in July and March are different. Bestseller lists are still entirely dominated by traditionally published books. My take on this, as before, is as follows: Self publishers, have faith. The Indian self- publishing and ebook market is untapped, so sky is the limit! The bestseller lists are still dominated by Nonfiction books such as Word Power Made Easy by Norman Lewis and study guides for Competitive Exams. One can clearly factor in the impact of Competitive exams (which as I said before are mostly held in May and June every year). I was surprised that most of the Fiction books that feature in the bestseller lists were published 2 years ago or even prior. Among the books by International authors, The Fault in Our Stars and The Monk Who Sold His Ferrarri featured across multiple sites. Books by Indian Authors who write fiction, particularly Chetan Bhagat & Ravi Subramanian, have not featured prominently, though both authors are releasing their new books in the coming weeks. The bestseller list for fiction may change in next quarter- and I hope for an update to this post in October 2014. 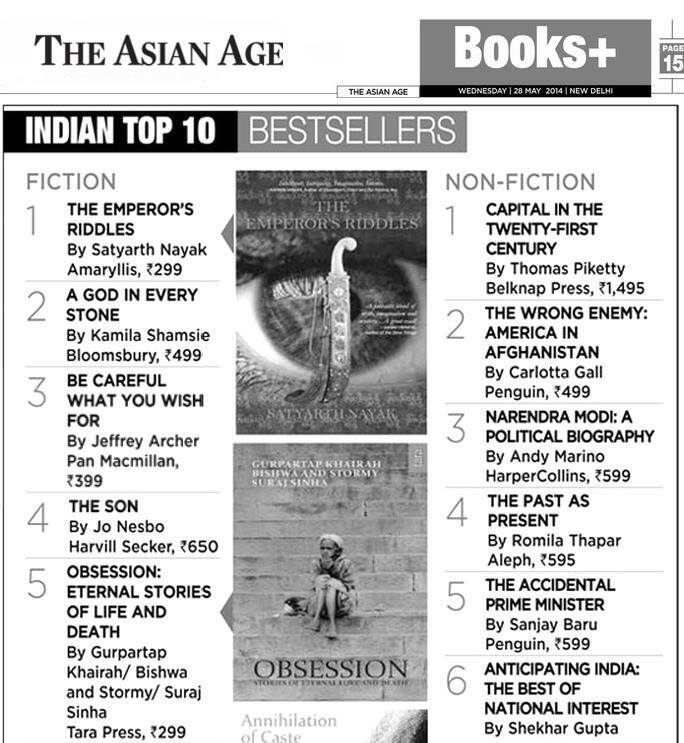 The books by Amish Tripathi (The Shiva Trilogy) still feature in the top 20 lists, but they now figure in the teens. In April, his books were mostly in the top 10 across multiple sites. Are the publishers really doing a disservice to Indian readers by not publishing Indian edition of books such as those by Jonas Jonasson to Indian market? Look at the price of these books in the figure below! Someone is really on some high grade <<insert the name of the first controlled substance that you can think of>>. I have not read any of this author’s books, but I was in Frankfurt and Berlin last month and I could see his books in multiple bookstores. Or are the publishers simply trying to cash in on the popularity of a few known foreign authors (Dan Brown, Rhonda Bryne, Jeffery Archer, and the likes) and Indian authors (Amish Tripathi, Chetan Bhagat, Ravi Subramaniam…) and keep milking them? 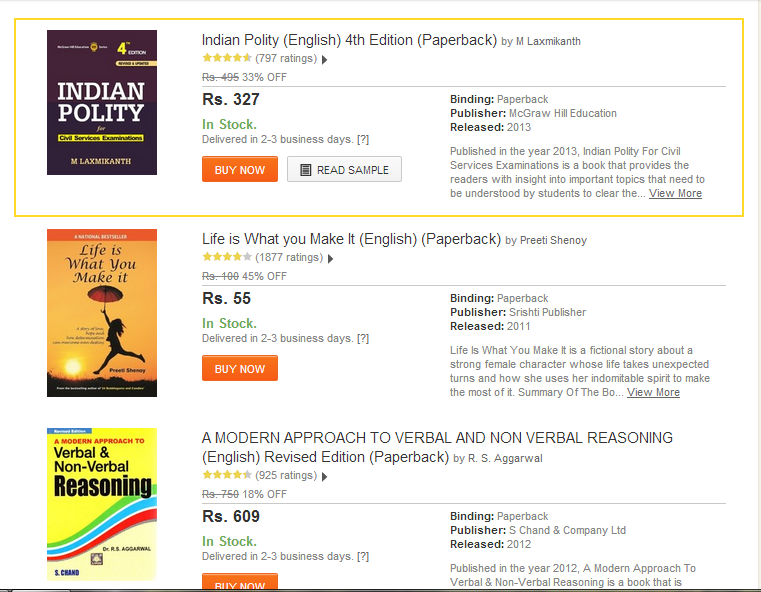 The same site (Amazon) has listed a Low Priced Indian Edition of Power of your Subconscious Mind by Michael Hutchison. Why can’t this be repeated for other authors? Alternately, will sites such as bloody good book help in bringing books by new talent in the bestseller list? Time to drop Kobo for now from further analyses. The average MRP of their top five or six selling books is over Rupees 1,500 or over $ 25. These are mostly cookbooks, and these books seem way overpriced for Indian market. Moreover, their list is dominated by one author’s books: Lawrence Block. The see the screenshot below. It almost looks like spamming the website. I hope Kobo will fix this as soon as possible. 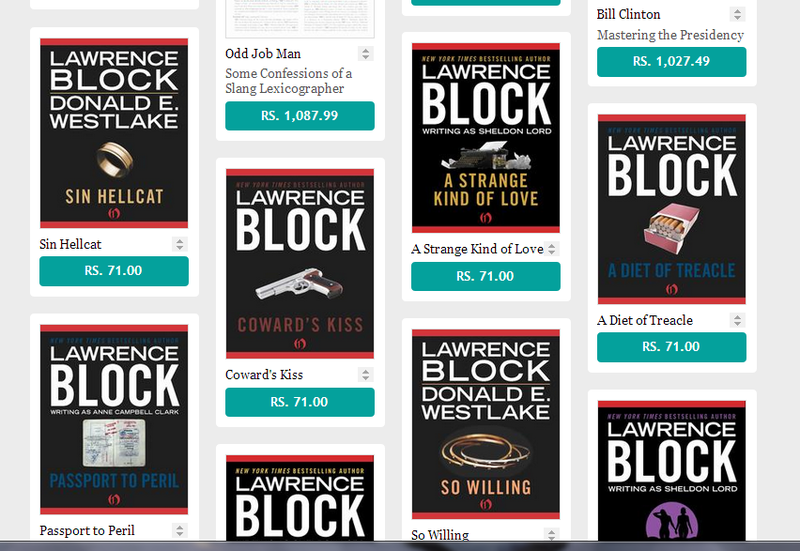 the Top 20 selling books on Kobo (India page) are dominated by books written by Lawrence Block. I also plan to drop data collection from Crossword and Landmark bookstores in subsequent editions. My focus is on ebooks- and the traditional stores are not really selling them in volumes, ans I feel that tracking these two sites may not be worth the effort. I have provided links in the raw data sheet for those who are interested for their own analyses. I was able to find some indication of how much the bestselling audiobooks are priced at – again in terms of MRP per page. This information, however, is for the audio version of Amazon’s top 20 selling books only. Infibeam was the only other site where I could see some information on audiobooks. 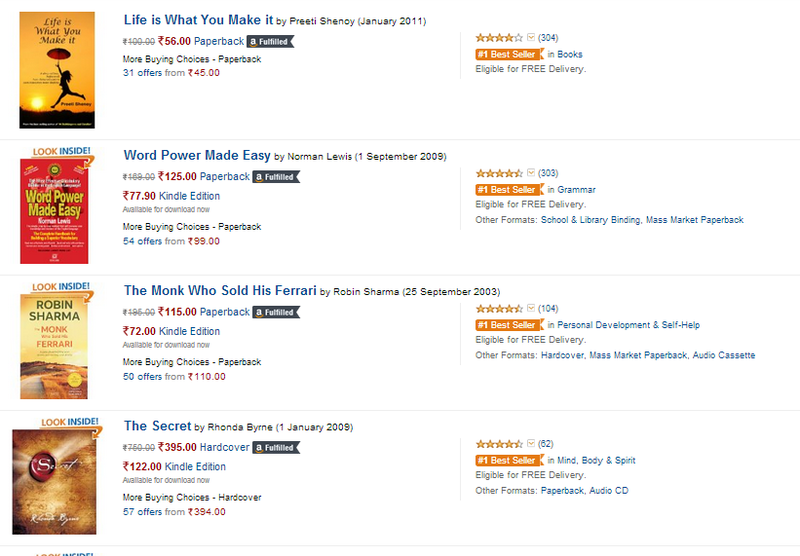 However, they had only two items listed under ‘bestseller’ category for audiobooks. One was sold as cassettes for Rs. 3,300 (that is over 50 dollars! ), and the other one was in Hindi. I dropped the latter form consideration because Hindi is not in the data set yet. In a future iteration, I plan to fix that. Use the data with a grain of salt. These are ‘spot’ values and not trends, and prices of ebooks particularly on Flipkart seem heavily discounted. Some of the bestsellers are listed at Rs. 2; so obviously that is not the usual MRP. This could lower the Average MRP per page than it actually should be. I have not removed the outliers. Also, on Google Play, sometimes there is a mismatch between the number of reviews that are shown next to description of the book and the actual number of reviews. I hope we can get some more information on Audiobooks. Once ACX becomes available in India, this might be an easier task. Till then, one has to keep looking. In the next quarter, I will focus on Fiction only and look at the non-top 20 books also maybe expand horizon to top 50 because Nonfiction books (read: study guides for competitive exams) are really clouding the data. I also plan to take a look at which books consistently figure across sites. 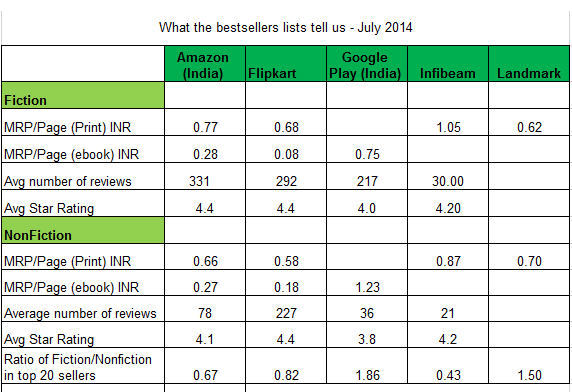 And before I forget, here is the data file : July-2014-Top-20SellingBooks-India. If you like this post and find the information useful, please leave a comment in the comments section below or message me on Twitter at @amarauthor. Next Post Cover Design Finalized! Commendable job, Amar. An insightful post. Saving this for future reference. Dear Neelesh, Thanks for your comment & feedback.Glad you found the post useful!